Brigham and Women's Hospital (BWH, "The Brigham") is located adjacent to Harvard Medical School, of which it is the second largest teaching affiliate. It is the largest hospital of the Longwood Medical and Academic Area in Boston, Massachusetts, US. With Massachusetts General Hospital, it is one of the two founding members of Partners HealthCare, the largest healthcare provider in Massachusetts. Brigham and Women's Hospital conducts the second largest hospital-based research program in the world, with an annual research budget of more than $630 million. Pioneering milestones include the world's first successful heart valve operation and the world's first solid organ transplant. Elizabeth Nabel is the current President of Brigham and Women's Hospital. In 2016, Brigham and Women's ranked number six in the annual U.S. News & World Report hospital rankings, the hospital dropped out of the top-20 status in the 2017–2018 ratings. This is the first time the hospital did not make the top-20 cut in the past 24 years. In the latest ranking, Brigham was listed as the number two hospital in Boston and in Greater Boston and number 11 in adult specialties. Overall, the hospital ranked in 11 specialties. Dana-Farber/Brigham and Women's Cancer Center: The center brings together a cancer institute and a hospital, creating 13 specialized disease centers. Carl J. and Ruth Shapiro Cardiovascular Center. Brigham and Women's Orthopedic and Arthritis Center: They specialize in research and therapies for bone and joint disease and injury. Brigham and Women's Neurosciences Institute: The BWH Neurosciences Institute offers treatments for all diseases of the nervous system. The institute integrates neurology, neurosurgery, psychiatry and neuroradiology, with advanced research and clinical trials. Mary Horrigan Connors Center for Women's Health: BWH specializes in high-risk obstetric care, newborn intensive care, infertility services, complex gynecologic surgery, and gender-specific care. Osher Center for Integrative Medicine including chiropractic care. In the early 1990s, BWH pioneered Computerized Physician Order Entry (CPOE) to prevent medication errors. BWH has received patient safety awards for its electronic Medication Administration Record (eMAR) and bar-coding system, which places barcodes on patients' medications, name bands and nurses' badges. A nurse scans all three barcodes before administering a medication to ensure that each patient receives the correct medication and dosage at the correct time. The orthopedic surgery department focused on patients' satisfaction for those who received knee and hip replacements. Leaders in the department included John Wright, Mary Anne Kenyon, and Carolyn Beagan, but they gave little attention to holding costs down. In 2013 the BWH Biomedical Research Institute (BRI) received $630 million in research support from all sources. For over a decade, it has been one of the two hospitals receiving the most National Institutes of Health (NIH) funding among independent hospitals in the United States. It employs over 3,300 researchers. BRI has worked on regenerative medicine, designing nanoparticles to attack different types of cancer, and starting a clinical trial for a type of Alzheimer’s disease vaccine. BWH research also includes population studies including the Nurses’ Health Study and Physicians’ Health Study. The 21st century has seen dramatic shifts in the diagnostic and therapeutic approach to lung carcinomas, beginning with the discovery of EGFR mutations and their role in directing management with targeted tyrosine kinase inhibitors. Since 2003 this has reshaped the approach at the molecular diagnostic testing center at the Brigham and Women's Hospital/Dana-Farber Cancer Institute. In 2017, the hospital will host the first human clinical trials to reverse the ageing process using NAD+. The trials will be headed by biologist David Sinclair. Former site of the Free Hospital for Women across the street from Olmsted Park. 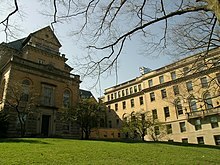 This institution was absorbed into Brigham and Women's Hospital. In 1954, the Peter Bent Brigham hospital became the location for the first ever successful kidney transplant, performed by Joseph Murray, on Richard Herrick. After a 10-year affiliation with Faulkner Hospital in the Jamaica Plain section of Boston, BWH merged with the community hospital in 2012 to form Brigham and Women’s Faulkner Hospital. In April 2017, Brigham and Women’s announced they would be offering voluntary buyouts to 1,600 staff in an effort to control costs. The hospital is currently profitable, but this move was due to higher labor and other costs, while payments from insurance companies is projected to have little to no increase. The hospital also need to pay for two large projects, a $550 million new outpatient and research building that opened last year and a $335 million new software system that launched in 2015. Also in April 2017, the United States District Court for the District of Massachusetts announced that Brigham and Women’s Hospital and their non-profit hospital and physicians network, Partners HealthCare, agreed to pay a $10 million fine to resolve allegations that a stem cell research lab fraudulently obtained federal grant funding. ^ Kowalczyk, Liz (2017-08-07). "Brigham and Women's falls out of top 20 in US News hospital rankings". The Boston Globe. Retrieved 2017-08-08. ^ "Brigham and Women's Hospital". U.S. News & World Report. Retrieved 2017-08-08. ^ a b c "Boston Hospital & Medical Center - Brigham and Women's Hospital". www.brighamandwomens.org. Retrieved 2 April 2018. ^ "Patients Come First at Brigham and Women's Department of Orthopedic Surgery," Journal of Bone and Joint Surgery, American Volume (March 2013) Special Report, Jeffrey Shyu, p17-23. ^ "Scientists unveil a giant leap for anti-aging". sciencedaily.com. Retrieved 2 April 2018. ^ Massachusetts Health Policy Commission (18 December 2013). "Preliminary Review of PHS Proposed Acquisition" (pdf). mass.gov. pp. 1, 5. Retrieved 8 November 2014. ^ McCluskey, Priyanka Dayal (2017-04-27). "Brigham and Women's offers buyouts to 1,600 workers". The Boston Globe. Retrieved 2017-04-27. ^ Finucane, Martin (2017-04-27). "Partners, Brigham and Women's to pay $10m in research fraud case". The Boston Globe. Retrieved 2017-04-27. Boston Hospital for Women Records, 1926–1983 (inclusive), 1966–1979 (bulk). BWH c5. Harvard Medical Library, Francis A. Countway Library of Medicine, Boston, Mass. Brigham and Women’s Hospital records, 1913– (inclusive), 1980–2000 (bulk). BWH c1. Harvard Medical Library, Francis A. Countway Library of Medicine, Boston, Mass.